One of my favourite parts of Christmas celebrations is cooking and baking for friends and family in the couple of weeks up until the big day. I’ve been lucky enough for the past two years to have my lovely housemates to cook a Christmas meal for, which I love to do and hopefully they too enjoy getting into the Christmas spirit through tasty festive food. 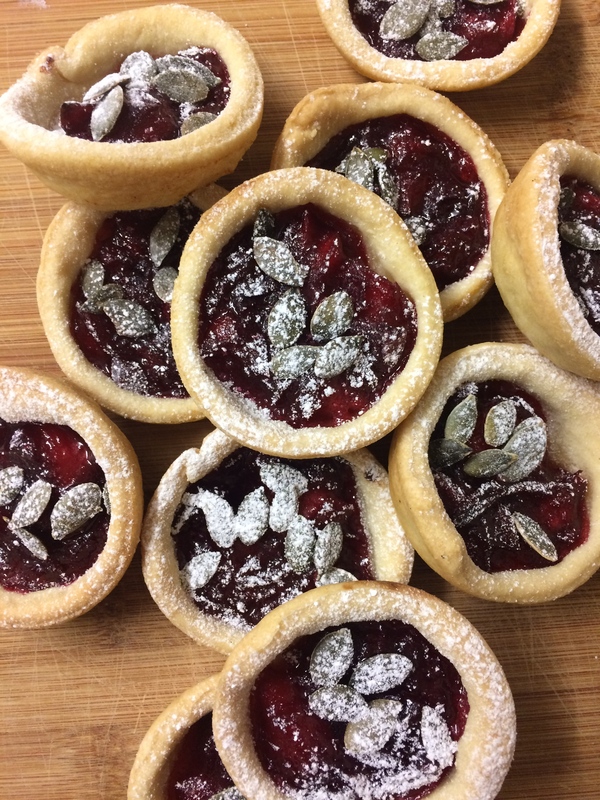 I usually make mince pies every year too, and although most people are quite happy to settle down in the evening with this traditional Christmas pud, I decided to have a go at making some alternative ones. These would be perfect for any particularly fussy friends or family over the festive period, or just as something a bit different to munch on after a big Christmas dinner. The pastry recipe I use here is totally fail safe. It is from a Kenwood processor recipe book, and I use my processor to make the pastry too. You could also make the pastry by hand, or just buy a pack of ready-made shortcrust pastry. If using a processor, add the flour to the machine and pulse a few times to sift out any lumps. Add the butter, very cold from the fridge and cut into small cubes, the key here is to handle the pastry and butter as little as possible. Add a pinch of salt and a sprinkle over 2 tablespoons of the water. Turn on the processor on a medium speed and keep adding the rest of the water until the pastry forms a cylindrical shape and moves around the bowl of the processor, coming together. Take the pastry out, wrap in cling film and leave in the fridge for 30 minutes to firm up. While your pastry is in the fridge, or if you’ve bought your pastry in a packet then this is where the recipe starts. Set a large saucepan on a medium heat, add the sugar and juice and zest of both clementines. 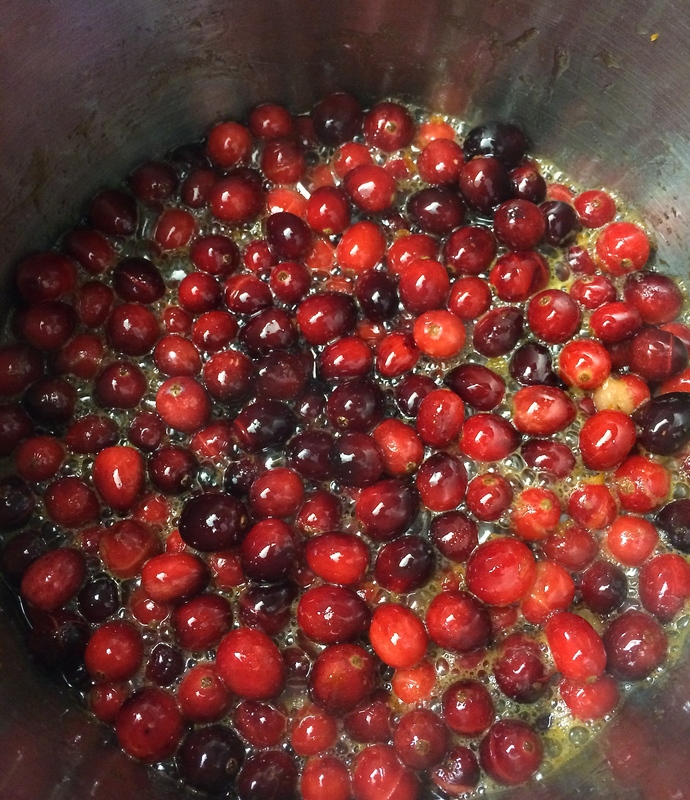 Once the sugar has dissolved, add the cranberries and stir occasionally, leaving them to simmer for 10 minutes. While the cranberries are simmering, peel and chop your apple into small chunks, then add to the cranberries once 10 minutes has passed. Add the water in little bits if the mixture starts looking too thick or begins to stick to the pan. Bubble away for another 10 minutes, making sure most of the cranberries have broken down and the apples are soft, again adding water if the mixture thickens too quickly. Once all the fruit is soft, turn off the heat on the pan and retrieve your pastry from the fridge. Grease your cake tin (I’ve used a 12 hole cupcake tin, but smaller or larger muffin or fairycake tins also work, just adjust the size of your cutter accordingly). Roll out the pastry and cut out circles that will give you 1cm sides to your pies, I had to play around a bit with sizes of glasses used as cutters so you may need to experiment depending on your tin! 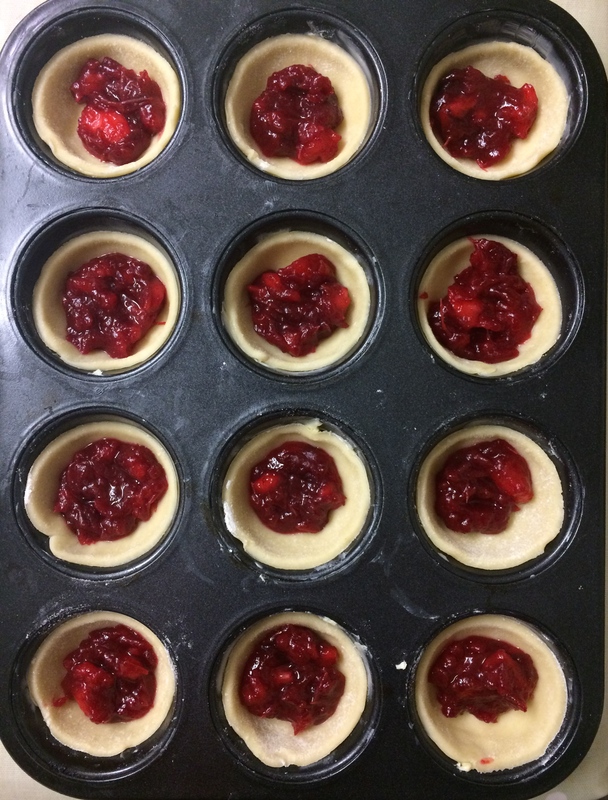 Put the pastry into the holes and then fill with a heaped teaspoon of the cranberry mixture. Don’t completely fill the pies as the mixture will bubble over and you will not be able to prize the pies from their tin once they are baked. I topped my pies with some pumpkin seeds, you could use pecan nuts or any other festive topping! Bake for 25 minutes until the pastry is light golden brown. Leave to cool in the tin for 5 minutes before leaving to cool completely on a cooling rack. I then dusted mine with some icing sugar to complete the recipe! Let me know if you have a go at this one, and Merry Christmas!